Description: Appends dates to file and directory names. Visit the homepage for usage examples. 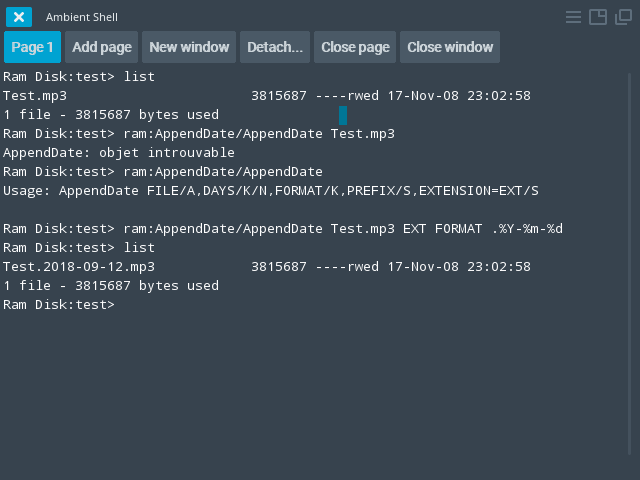 AppendDate -- appends a date to a filename or directory name. of directory name, it must not contain the trailing '/'. example DAYS=-1 will append yesterday date. The default value is 0 (today). Note that resulting date can't be earlier than 1978-01-01.
generated with locale.library/FormatDate(), so its documentation applies. %x - same as "%m/%d/%y"
separated from a filename with '_' (underscore) in this case. PREFIX - Places the date at the start of name instead of the end. separator. Note that this argument is ignored, if PREFIX is specified. - Added: EXTENSION and PREFIX arguments. - Fixed: DAYS argument was ignored if FORMAT was used.